Drink from the chalice, and join the ranks of the unseen immortals. You're on the inside now. You know what must be done to defend Queen and Country, to defend everything we've built, everything we stand for. You deserve access to the innermost sanctum, and this is your key – the EDOM FIELD MANUAL. It will tell you everything you need to know about Operation Edom – what we do, how we do it, and what we're working towards. It will also teach you how to handle our special assets, and how to put them down if they go rogue. For more than a century, the top-secret operation within MI6 codenamed 'Edom' has defended the United Kingdom from the machinations of the Un-Dead. This book describes the operation's history, methods, and tradecraft, initiating you into the innermost secrets of the British vampire program. For players – create your own Edom officers and hunt vampires with the sanction and backing of the British government! Immerse yourself in the clandestine world with eyes-only documents and briefings. Call on Dukes for aid and counsel, gather intel with the aid of Edom's networks of informants, and gear up with specialised anti-vampire weapons and tactics. Use the Fields of Edom campaign frame to play the spies hunting for the stolen Dracula Dossier, or defy your masters and complete the original mission by taking Dracula down for good. For Directors – Build your own Edom with a guide to the operation’s structure and methods. Two dozen non-player characters give you a supporting cast for Edom-centred games. Explore Edom's secret history and render its shadowy present in vivid detail. Advice and campaign options help you bring the operation to a thrilling conclusion – or a bloody catastrophe. So watch for the cup-and-blaze mark and the hand signal. Keep your kukri close, and remember your training. Four generations of agents have passed the cup on to you – do not falter at the last! 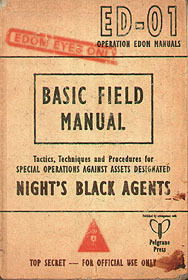 The Edom Field Manual stands alone as a guide to a vampire hunting program. Combine it with the other books in the Dracula Dossier series for insight into Edom its machinations.